A London-to-Washington flight carrying the singer formerly known as Cat Stevens was diverted to Maine and the singer was removed from the plane after his name came up on a U.S. watch list, federal officials said. 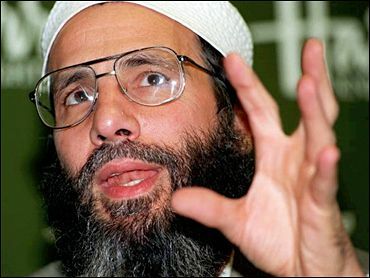 The singer, now known as Yusuf Islam, had recently been placed on a government "no-fly" list after U.S. authorities received information indicating associations with potential terrorists, a government official said Wednesday. Homeland Security Department spokesman Dennis Murphy said Islam was "interviewed and denied admission to the United States on national security grounds" and was expected to be sent back to London on Wednesday. Islam drew some negative attention in the late 1980s when he supported the Ayatollah Khomeini's death sentence against Salman Rushdie, author of "The Satanic Verses." Recently, though, Islam has criticized terrorist acts, including the Sept. 11 attacks and the school seizure in Beslan, Russia, earlier this month that left more than 300 dead, nearly half of them children.